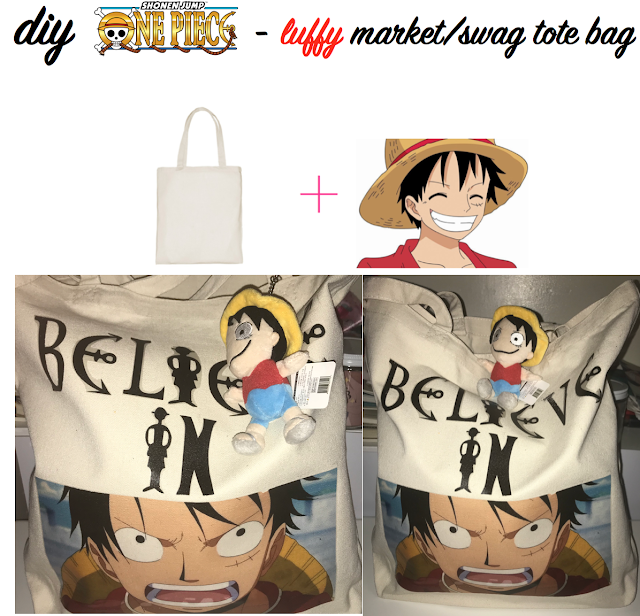 DIY a simple tote with Luffy and a quote! 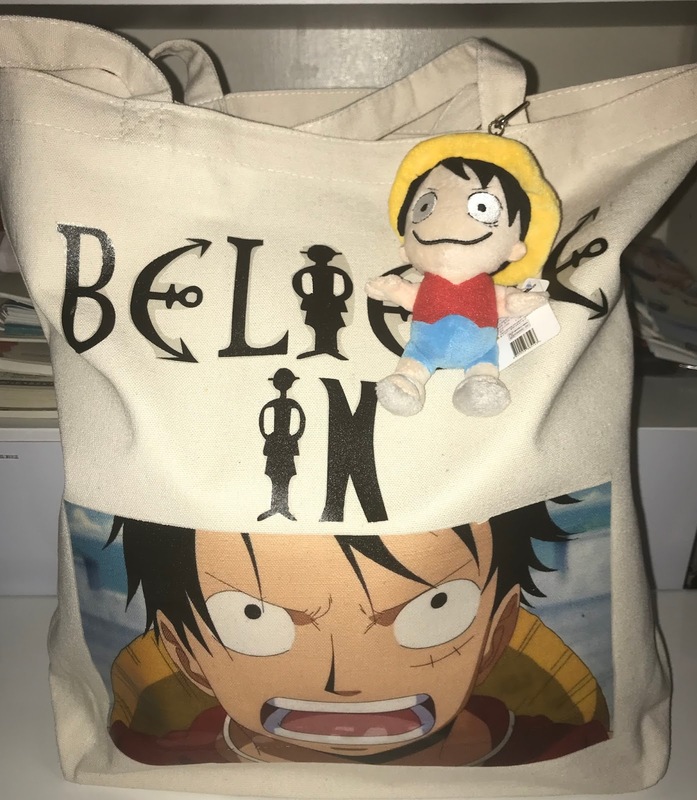 Customize a One Piece anime themed tote to use as a swag bag at the next con! *this project requires use of a printer, so make sure there is enough paper and ink to print! * I will go through all steps on how to download the 'One Piece' font and how to place all of the text on one page without using Photoshop (only for macOS). BUT I will go through these steps at the end of this post. I have linked a download of the quote and picture that I used for this project in the steps below. A little background on the quote if it's unfamiliar. The quote is from Usopp, this is during the Water 7/Enies Lobby Arc after Robin's motives for leaving the crew became apparent and Usopp, Sanji, & Franky were trying to rescue her on the sea train. When she refused to be rescued and Usopp realized why, he told her that no matter what she can always believe in Luffy! And honestly, that is kind of a good quote for the whole show! Also, this quote is from the English dub version of One Piece. 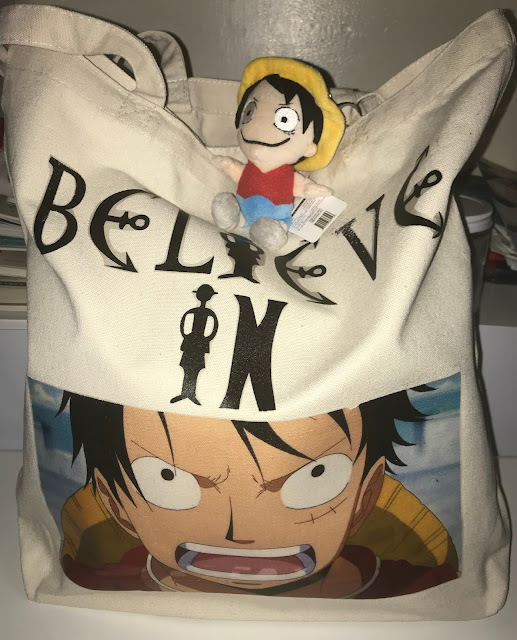 In the manga, I believe Usopp says something like 'have faith in Luffy'. I like the English dub one more. 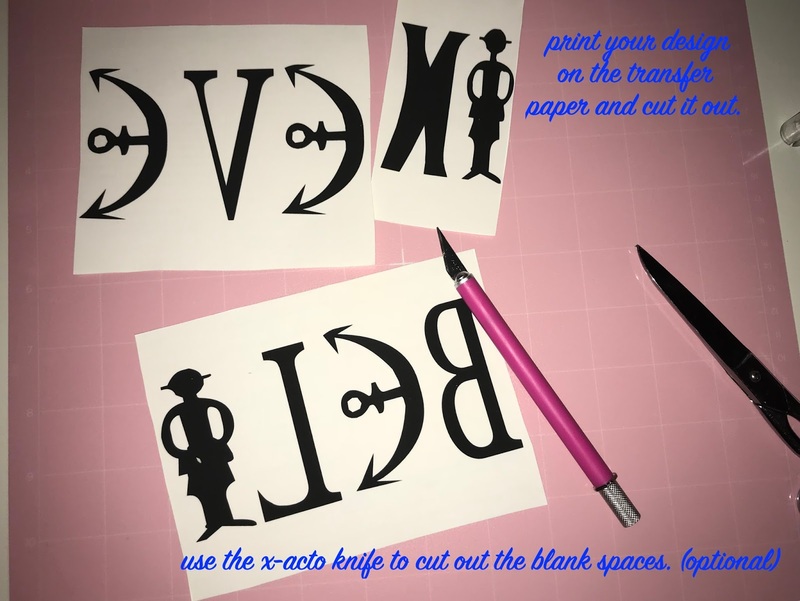 *please note that this tutorial was made by using transfer paper for inkjet printers, not sure if the same steps apply to transfer paper for laser printers. Here is my Google Drive link for the text and picture I used. 1) Print a sample of your design on regular printing paper first. 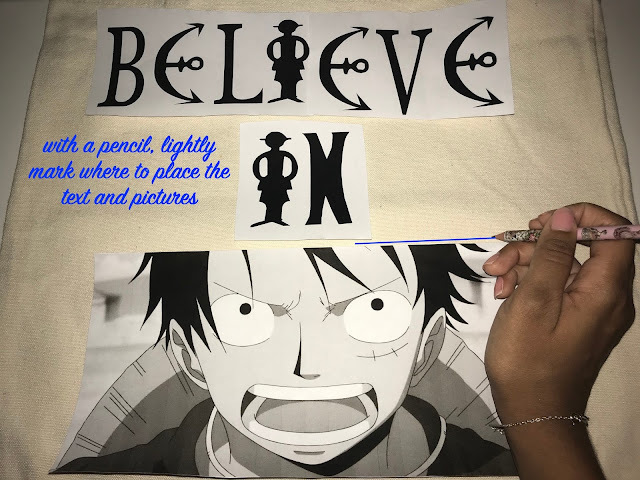 Cut it out and place where you would like to put your text and picture(s). 2) Once your have decided on a layout, take a pencil and lightly mark where each piece will be. I made small lines to mark my placement. 3) If your computer or printer doesn't have a setting for transfer paper then please remember to flip all texts and pictures horizontally before printing and set standard to highest quality. 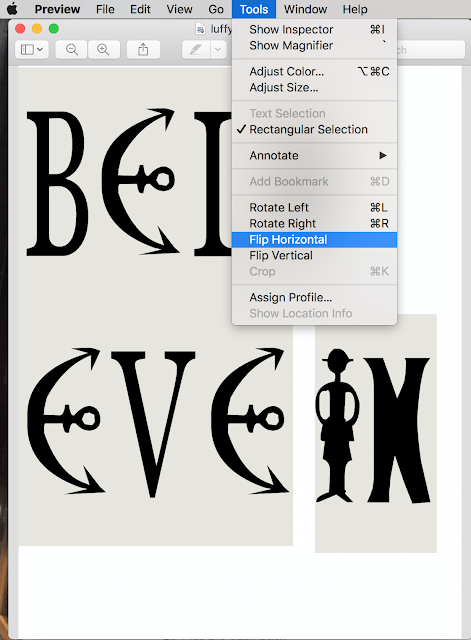 If you can't flip your design using your computer applications then go to flipapicture. 4) Print out your design on the transfer paper and cut out any needless white or extra spaces. 5) Optional. Use an x-acto knife to cut spaces from between and inside letters. Before using an x-acto knife, make sure to cut on a hard surface or a self-healing or cutting mat. 6) On a hard surface like a table, place a cotton pillow case down and lay your bag on top. Before turning on your iron, empty out any water inside to avoid accidental steam. Make sure the iron is set to the highest setting for cotton fabric. 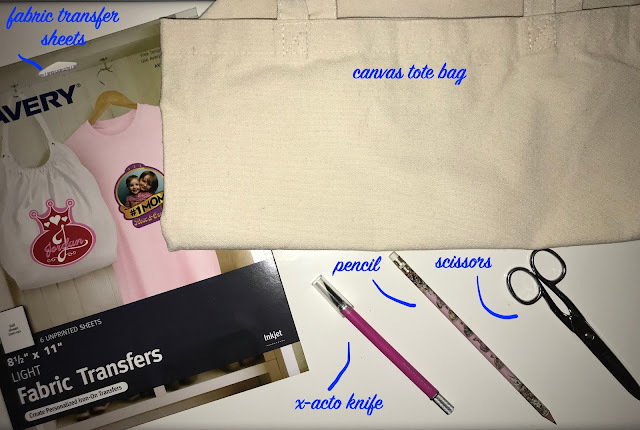 Using the pencil marking, place your text and pictures on your bag. 7) Place a single cotton sheet or cotton handkerchief over the bag to hold the letters in place while you iron. Follow the instructions from the transfer paper packet. Basically iron slowly horizontally then vertically while pressing down slightly. 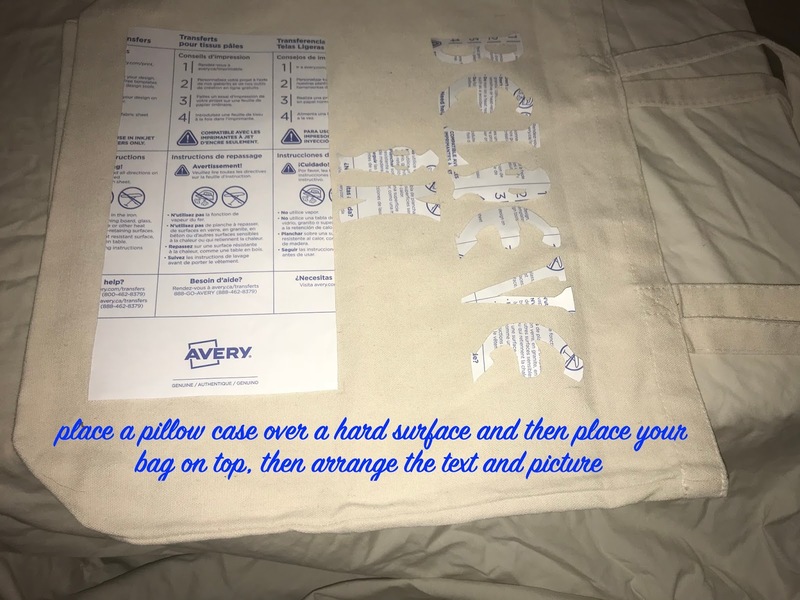 When you notice that the letters are sticking to the bag, then remove the cotton sheet and continue to iron focusing on the edges. 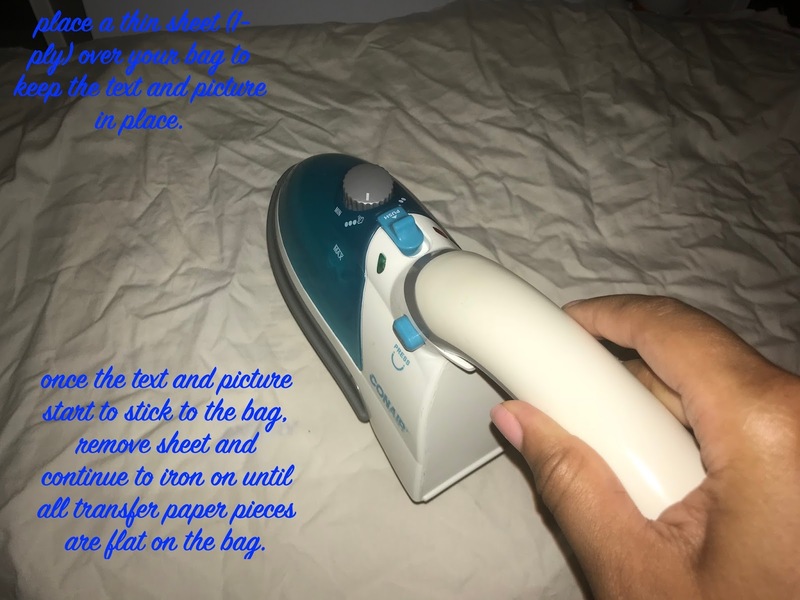 8) I was so focused on ironing that I forgot to take pictures of how to peel off the paper. Make sure you move the bag to another surface to let it cool for about 2 minutes. Then, start peeling off the texts and pictures slowly. If you notice part of the transfer hasn't stuck onto the bag then place the paper back down and iron over it again. *I got a little clumsy and my iron brushed over one of my letters after I peeled it off and gave it the Infinity War snap effect. But it's nothing a little black marker can't fix. So if you do mess up, just use a marker. *these steps are only for macOS, if you have similar programs(not macOS) then it should be easy to follow. 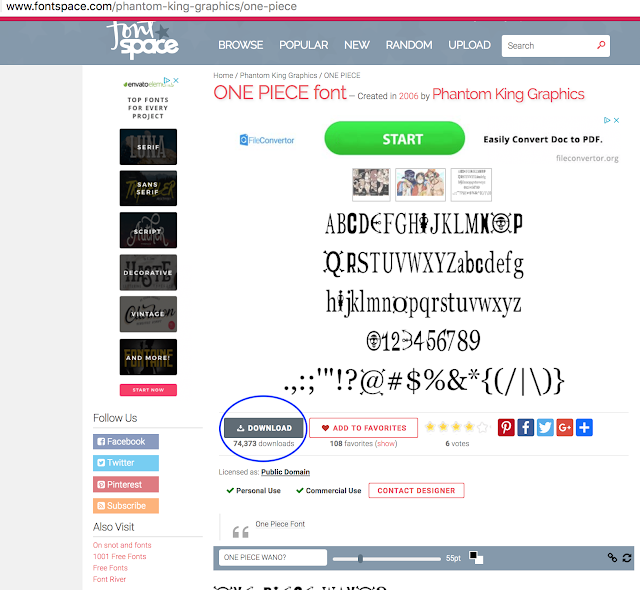 1) Download the 'One Piece' font and click the .zip folder to set it up. It should automatically be available in Pages. 2) Open Pages and type out desired quote. Make sure it's big enough for your bag. 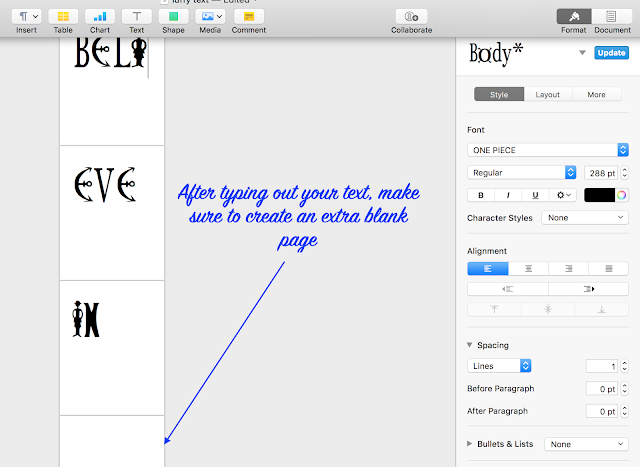 Create an extra blank page after writing out the quote. 3) Optional. Use Advanced Options on the side tool bar to highlight your text in the same color as your bag. 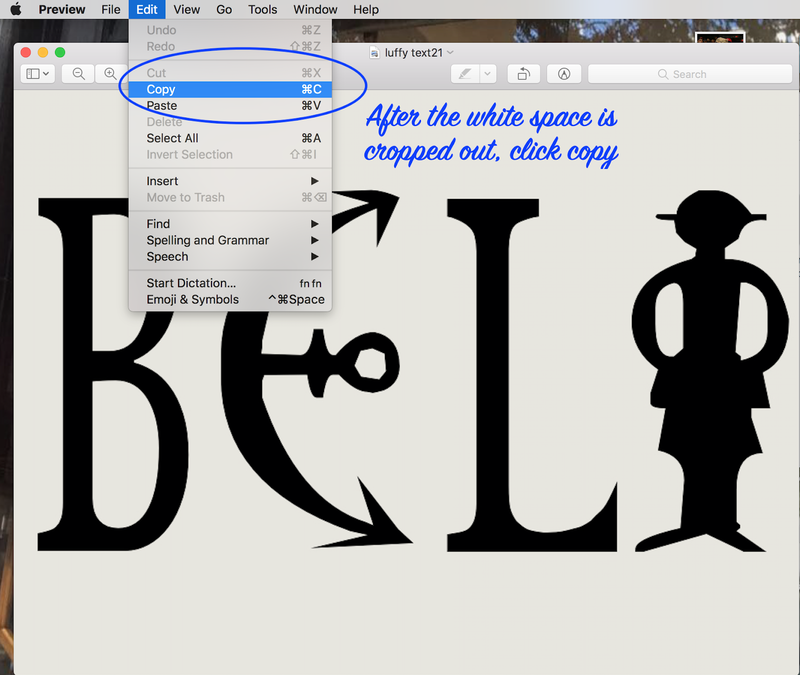 The negative spaces around your text will be less visible this way. 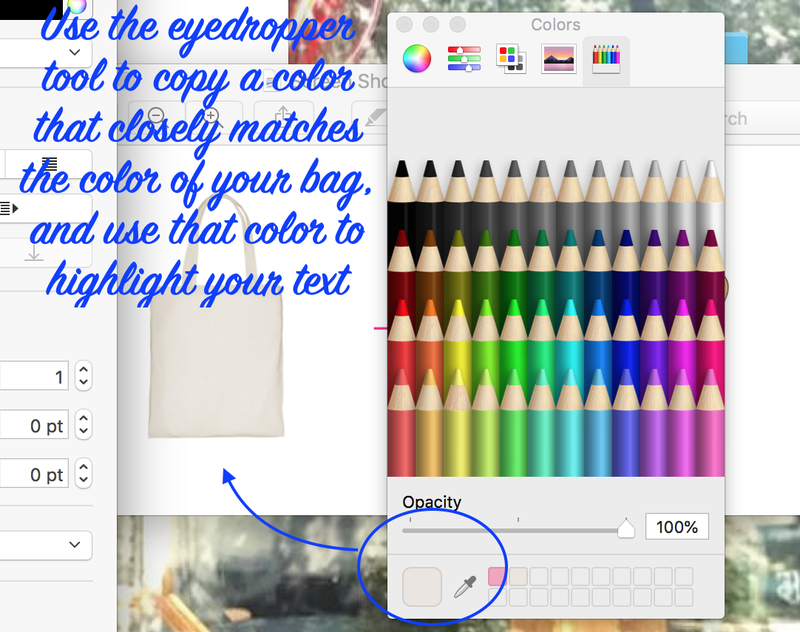 4) Use the eye dropper tool to copy a color that is similar to your bag. 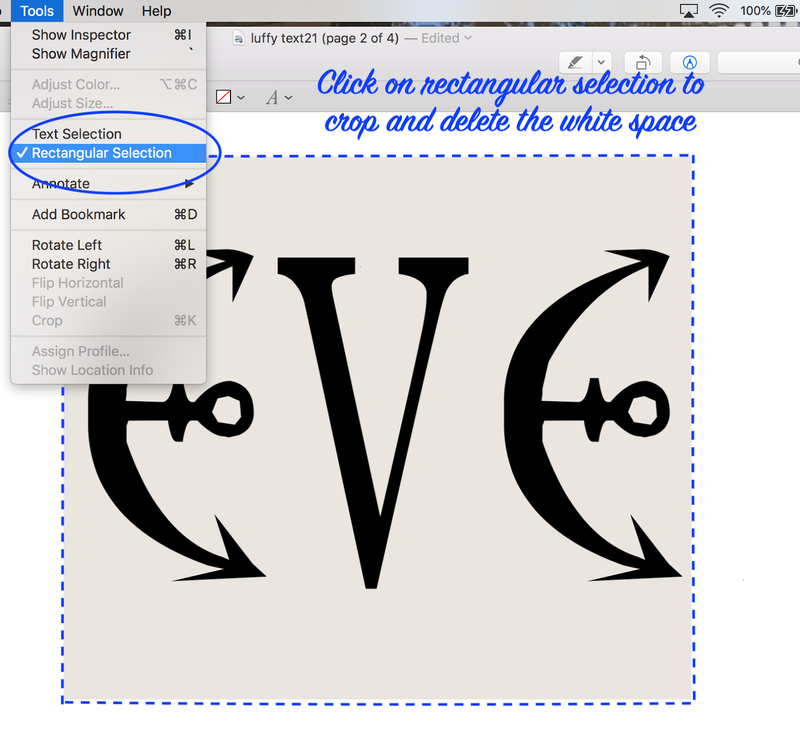 You can use Google or the site where your purchased your bag to use the eye dropper tool on. Once you have the color, you have to drag it into the mini boxes on the right side of the eye dropper for use. 5) Export the Pages document to PDF on the highest quality. 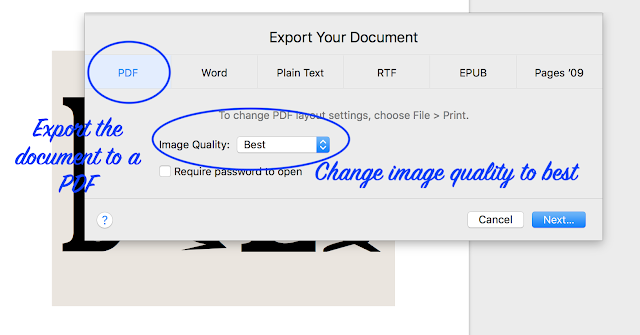 6) Open the PDF in Preview and export each page as JPEG set at the highest quality. 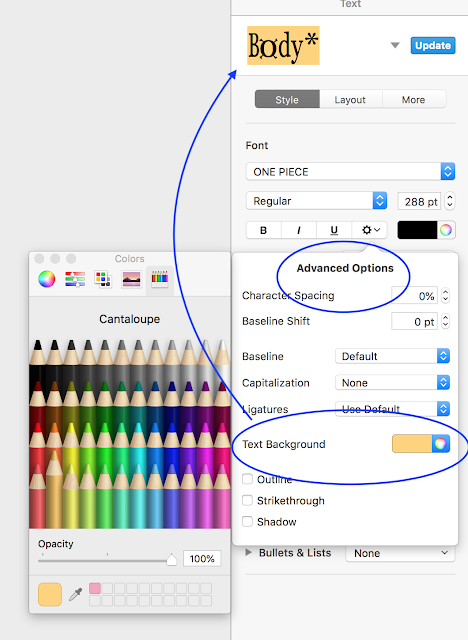 Don't forget to export the blank page as well. 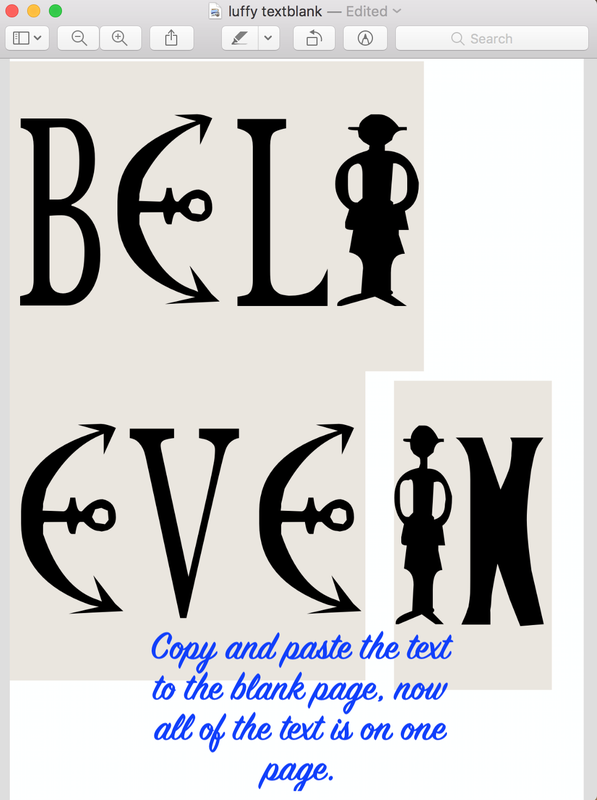 8) Copy the now cropped texts and paste each of them to the blank.jpg. Here, you can squeeze the texts together so that it is on one page. 9) Follow steps 1 & 2 from the first set of directions above. 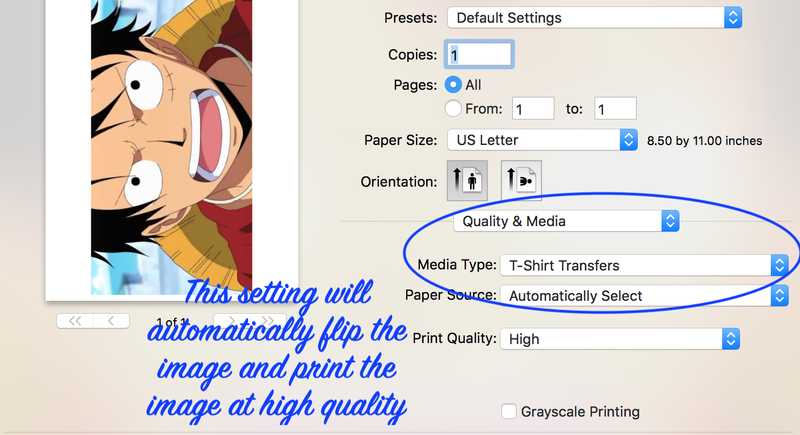 10) When you are ready to print on the transfer paper, Quality & Media menu in Print (click print details) should give the option of printing on transfer paper. If not, then flip the texts and images horizontally in Preview before printing. 11) Follow the rest of the steps from the first set of directions from above. 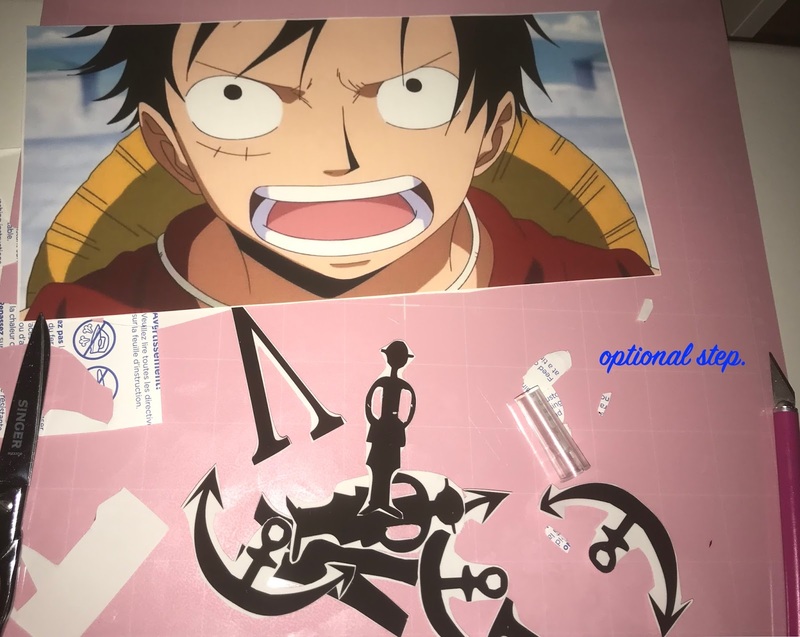 More One Piece DIYs next week!